Handcrafted by skilled artisans with natural finishing and hand-polishing. Handling Time: 10-15 days approx. 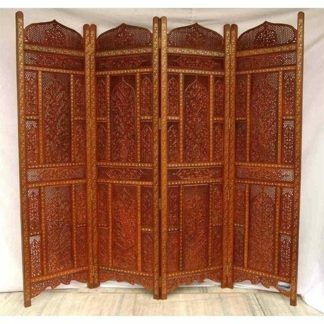 Aarsun Woods brings you this beautifully handmade Wooden Partition / Room Dividers mostly used in Drawing Rooms / living Room as a Divider for separating a space. Room Divider Made from Premium Quality Sheesham Wood (Rosewood)), the unit consists of 4 panels. Each panel made up of traditional Jaali Design with Kalash carving all over. The Wooden Partition Screens consists of fine carving which extends to each of the panel mirroring the adjacent panel quite evenly. A wide range of Shades and designs are available in Wooden Room Dividers. The Room Dividers / Partition Screen can be customized as per customer required. The length of the Wooden Partition screen can be extended by increasing the number of panels. The standard size of the Wooden Partition screens each panel of 6 feet approx. in height (72 inches approx.) and 20 inches in front width. Add a graceful touch to your living room by placing this traditional Wooden Partition Screens in your drawing Room / Living Room or add an traditional touch to your Pooja Room placing it with Temple. The unit is handmade by skilled craftsman in Sheesham wood (rosewood). All of our Partition Screens comes in standard size and can be customized in 2 or 3 or 4 Panels depending upon the requirement. The Room Dividers is hand-buffed to give it an antique style look and traditional finish. Wooden Room Dividers / Partition Screens are packed in a wooden crate to avoid damage due to mishandling while in-transit. Our Partitions are dispatched within 6-7 days after receiving the order. In case of customized Room Dividers, it usually takes 20-25 days to manufacture. All the Room Divider Screens are dispatched from Saharanpur(India). The Partition Screens usually takes 10-12 business days.Yet, it depends on the shipping address. Please note that there is might be a slight changes in Size as well as in the shade of each Partition Screens. Each wood has its own texture and shade which gives each Room Dividers a unique look.Please contact us at +91-8192999135 to confirm the availability of a particular design. Wooden Room Dividers comes in a number of designs, we recommend you to have a look at our product Sheesham Wood Partition Screen, also at cash on delivery on Wooden Room Dividers / Partition Screens. 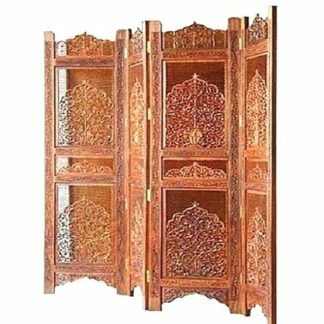 If you also like Mango Wood Room Divider , have a look at MDF Wooden Partition Screen,also in case you require fine carving in mango wood, go for Handmade Mango Wood & MDF Wooden Room Dividers.